Galerie Lelong presents Chicago Invites Chicago, a group exhibition highlighting the richness of contemporary artistic practices within a city that has fostered significant artist groups such as Monster Roster and the Chicago Imagists. Three Chicago-based artists were asked to invite another artist from their community whose practice they admire to show in the exhibition. 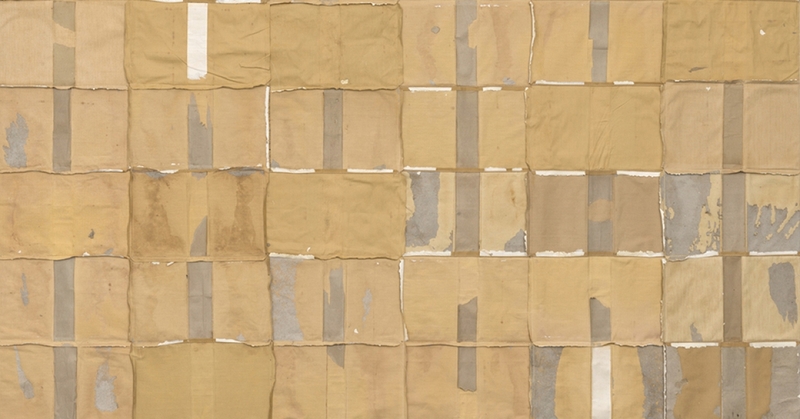 McArthur Binion (b. 1946) presents new work from his DNA: Seasons series, featuring hand-applied oil stick over copies of his birth certificate and address books. The resulting autobiographical abstractions forged from his personal narrative set him apart from conventional Minimalism, while still employing formal techniques of the movement. For the exhibition, Binion has in turn invited painter John Phillips (b. 1953), a former fellow at the Whitney Museum. The undulating, brightly colored shapes that occupy Phillips’ flat, enigmatic backgrounds recall the unwavering optimism of American Pop Art. Phillips often refers to Josef Albers in his work, playing with context across the surface to change the viewer’s perception of color. Anti-intellectual titles such as My Daddy Drives a UFO (2008), a song by the American punk band The Cramps, humorously call attention to the forgone era’s artifice. Samuel Levi Jones (b. 1978) strips book covers from encyclopedia sets and law books that are then sewn together to form a grid of contrasting textures between the roughness of page-less spines and smooth bound covers, which have been skinned. These examinations of the bound books’ formal qualities question the assumed authority and infallible knowledge of historical material, especially in relationship to the recorded history of women and individuals of color. Jones extended an invitation to Bethany Collins (b. 1984), with whom he shares a concern for issues of social justice and the power of text and language. Collins, who works in a neighboring studio in the same building as Jones, examines how language and word politics drive race relations in the United States, for instance the lack of nuance when racial identity is divided into binary words such as “black” and “white.” Comparable to Lewis, her work unwraps what words communicate outside of their historical or dictionary definition. The exhibition will feature two large-scale floor drawings by Tony Lewis (b. 1986) created from roofing paper, tape and dense layers of graphite. One drawing unfurls into a sculptural, topographical form while the other remains folded like a blanket – both creating three dimensional forms that differentiate from his earlier explorations using graphite to disrupt the linear structure of politically-charged words. Lewis has invited Nate Young (b. 1981), who presents new drawings in handmade wall frames that unfold like triptych altar paintings. Young intentionally creates an association between these objects and religious architectural elements. The conflation of this with the diagrammatic mark reveals how certain familiar, systemic forms convey power and trigger associations. Both artists delve into the semiotics of common materials in search of the power dynamics and social structures embedded within. Aside from their common history of showing in Chicago, Galerie Lelong’s selection of Binion, Jones and Lewis was based on their mutual respect and commitment to their artist community. Through the invitations extended by these three artists, Chicago Invites Chicago not only underscores the kinship between artist colleagues, but also highlights how their regard for other artists provides a unique context in which to view each other’s work.